UPDATE: Lucy & Taylor sea lions (pictured above in September 2017)! Both sea lion pups are growing by leaps and bounds...and you can certainly watch them leap and bound around if you stop by Pinniped Point. The pups have perfected their swimming ability and can be seen in the pinniped underwater viewing area checking out zoo guests often. At a little over 3 months old, both are still nursing from their mothers and will continue for at least 4 -6 more months. 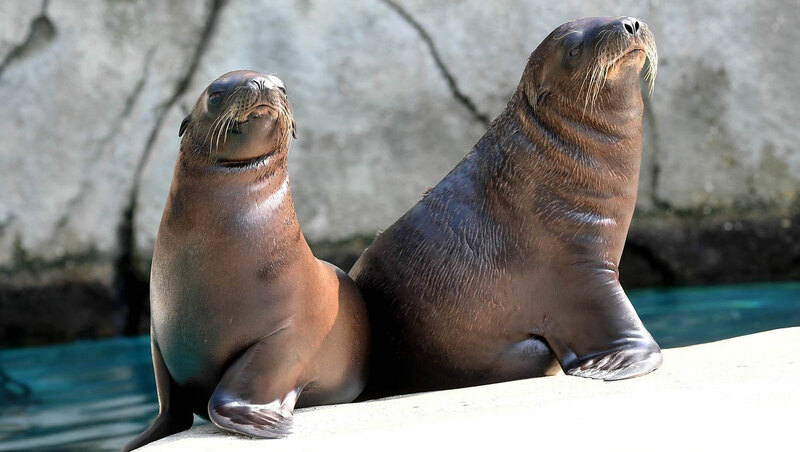 Guests visiting Brookfield Zoo’s Pinniped Point can now see two 1½-month old California sea lion pups. Until recently, the male and female pups have been behind the scenes learning to swim and bonding with their moms, Arie and Josephine. The two inquisitive pups spend the majority of their time outdoors, but will continue to have access to their indoor area while they get acclimated. Josephine gave birth to the female on June 4, and the male pup was born to Arie a week later on June 11. The pups have been growing steadily due to the richness of their mothers’ milk, which is high in fat. They each have nearly doubled in weight since their births, now hitting the scale between 25 and 35 pounds. They will nurse for at least five months and may continue to do so for more than a year. The pups are very important to the genetic diversity of the accredited North American zoo population for the species. Both their moms and Tanner, the sire, were wild born. For various reasons, all three adults were deemed nonreleasable by the U.S. government and given homes at three accredited facilities—Aquarium of Niagara, Brookfield Zoo, and Shedd Aquarium.